When was the last time you sent a greeting card? Most likely, you can’t even remember, but Apple believes it has figured out a way to get users to go back to sending greeting cards: through their iOS devices, with a new app, named Cards. The service will be pretty affordable, too. While the app itself will be free, sending greeting cards within the United States will cost $2.99 and $4.99 for international shipping. This is a great deal, especially for the latter. Apple already offers other services that involve printing content on paper, predominantly on iPhoto, where users are able to order professional printouts of their photos on great-looking photo albums, all provided by the Cupertino company itself. However, this service is likely to have more of an impact on the market than any of the company’s past initiatives. The creation of great-looking greeting cards straight from a device consumers have grown to love might drive many other online greeting card makers out of business, especially if Apple’s product turns out to be higher-quality. Shareholders have quickly realized this, which resulted in a sharp decline of the stock value of some of the most prominent greeting card companies. On the upside, this will hopefully provide the struggling U.S. Postal Service with some much-needed revenue. 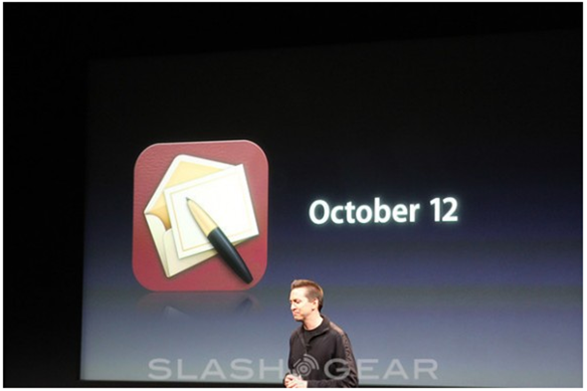 This app will be available on October 12th, just over one week away. Cards was part of a series of announcements made today at Apple’s iPhone-related event, where the iPhone 4S as well as the availability of iCloud and iOS 5 were announced along with launch dates.